Lets face it, it can be an adventure in some countries to find vegetarian food. Even if there are plenty of options, you still have to find them. Sometimes on your travels you will stumble across a great place exactly when you need to. Other times (especially when you are starving and jet lagged) it can be a painful process to get a vegetarian meal at short notice. We have been travelling through 26 countries since we became vegetarian and have a few tips for vegetarian travel. 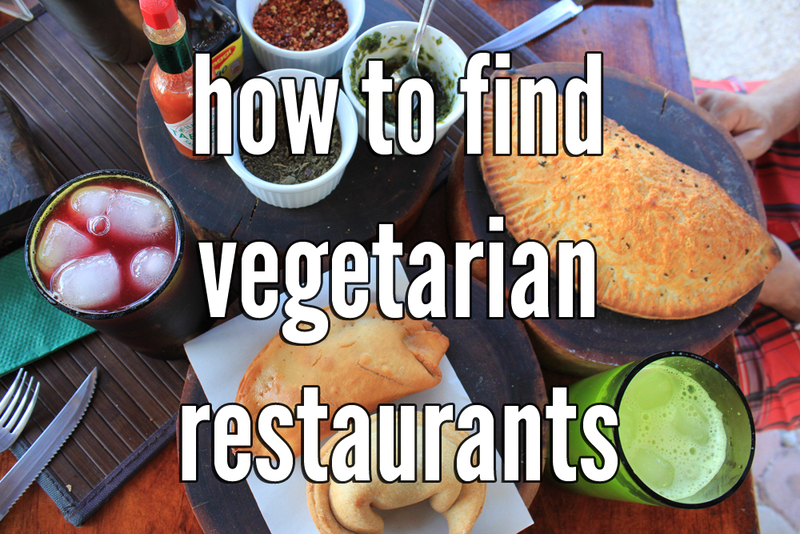 Happy Cow is a website and app that helps you find vegetarian restaurants all over the world. We have found some real treasures on Happy Cow that we really would have missed otherwise. Basically, people list vegetarian, vegan and vege friendly restaurants and then users go and rate them and leave comments. We use the app the most and it has a great maps feature. You can literally look at all the vegetarian places in a locality within seconds – very handy! The only downside is that in some developing countries the maps are not super accurate so read the reviews, because often other helpful vegetarians have left tips! What’s great about Happy Cow is that there are even tiny little street vendors and temples listed which you won’t find on the bigger review sites. TripAdvisor probably needs very little introduction to travellers. It is the big behemoth of review sites, but did you know you can find vegetarian restaurants on there too? 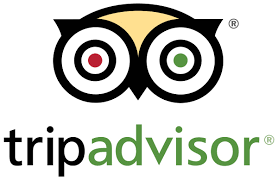 TripAdvisor will help you find established vegetarian restaurants, and you are likely to see more detailed reviews here than anywhere else. When we end up in a new city we will usually do a quick search on TripAdvisor for the best rated vege restaurants in town and on Happy Cow when we want to see what is available close by. Whenever we arrive in a city or country that doesn’t use English, we ask a hotelier or random person to teach us how to ask for what we want! We also get them to write it down and pop it into our wallets. Culturally lots of people don’t understand why you would be vegetarian and other people struggle with understanding that “meat” includes chicken, fish and ham. We usually ask for a culturally appropriate translated version of… We are vegetarian, we don’t eat any meat, chicken or fish. We do eat eggs, mushrooms and cheese. You may ask why mushrooms and cheese, but we have found that it helps to tell people what you can eat instead of meat. In Thailand you may also write down “no fish sauce and dried shrimp” which is often added to Pad Thai, even when you ask for no animals. Of course it all depends what country you are in. The friendlier you get with the locals the more likely you are to find out which dishes are suitable that you may never have realised was available. We first found Loving Hut in Puno on the high altitude banks of Lake Titicaca. We didn’t hold out much hope for meat-free in this small town, but Johnny found it on TripAdvisor and voila! We found ourselves in this amazing, packed vegan restaurant in small town Peru. Fast forward a year and we found another one in Melbourne, there we dicsovered that there there are in fact over 100 Loving Hut vegetarian restaurants serving up low cost, delicious vegan fare all over the world. There is no set formula with the food, except that it is all animal free and tasty! In case you missed the change – the new way to make the most out of Facebook is to join focused groups. There are plenty of vegetarian and vegan groups that are friendly places to get recommendations and ask questions. We arrived in Ireland a month ago, and joined the very friendly Vegan Dining Out (Ireland) to get the low down on local vegetarian eating. Even if you don’t find vegetarian specific groups, there are usually plenty of traveller groups, expat groups and entrepreneur groups in each town and city that are full of helpful people happy to give you recommendations. There you have it… 5 tips for filling your belly with sweet vegetarian food on the road!